Bringing you the best technical analysis of the day, every day. Indices: US stocks were a mixed bag on Monday, with the Dow Jones Industrial Average closing down 84 points or 0.32%. The S&P 500 and Nasdaq were able to end slightly positive, while the Russell 2000 finished down 0.22%. Sectors: Energy led for the second session in a row with a gain of 0.44%. Utilities lagged, falling 0.71%. Commodities: WTI Crude Oil futures gained 2.1% to settle at a new five-month high of $64.40 per barrel. Gold futures were higher by 0.5% to settle at $1,301 per ounce. Currencies: The US Dollar Index fell 0.34%. Interest Rates: The US 10-year Treasury yield rose to 2.52%. Here are some of the best charts, articles, and ideas being shared on the web today! Today’s chart of the day was shared by Ryan Detrick on Twitter (@RyanDetrick). It’s a chart of the S&P 500 index going all the way back to 1928 with the winning streaks below in orange. Detrick highlights the eight-day winning streak that the S&P has been on. As he points out in his tweet, we haven’t seen a streak this long since October 2017. If the index finishes positive tomorrow it will mark the longest winning streak in over a decade! In this quick read, Callum Thomas presents five charts that show a shift in sentiment among market participants. He expects a capitulation in pessimistic sentiment to propel the market higher in the coming months. Here’s a piece from JC Parets pointing out that equity markets are rallying not just here in the US but also around the world. In this video, technician, Andrew Thrasher, and Josh Brown discuss how Financial Advisors can benefit from a technical perspective. As we noted above in Today’s Chart of the Day, the S&P 500 index is on a hot winning streak. 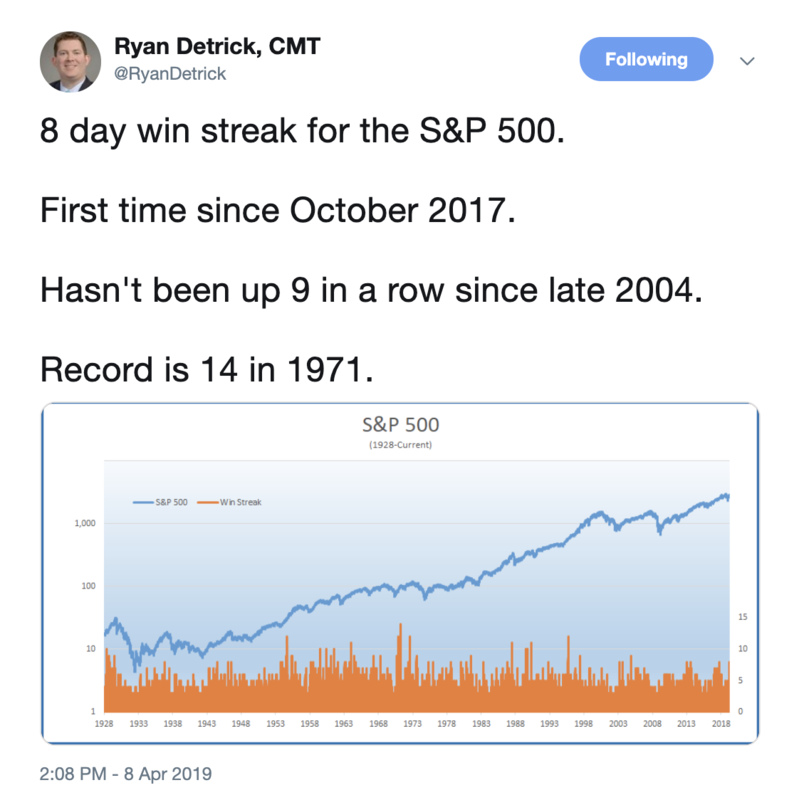 Seasonality expert Jeff Hirsch uses historical data to show that historically these long winning streaks indicate further gains in the months to follow. Behavioral/Trading psychologist, Dr. Brett Steenbarger gives his thoughts on where the stock market currently stands. He explains that he’s not seeing any signs of euphoria and that there seems to be broad participation from the individual components of the market. Still watching closely to see if the number of stocks getting overbought across each major index can reach new highs with price or if the recent divergence remains intact. Some magazine covers can be good contrary indicators. The Economist even admits it. © 2019 The Chart Report. All Rights Reserved.